The new Audemars Piguet Royal Oak Concept Supersonnerie is not simply a "chiming" watch, but rather a timepiece which houses a musical instrument in miniature within its sculpted watchcase. When the company released details of the first version of this piece last year, the RO#1, not surprisingly there were ripples of excitement in the industry. Perhaps it would be over-egging it to say that they had rewritten the rule book of Minute Repeater mechanics, but certainly - this was a new and interesting chapter. Now it is an on-the-wrist reality and, really, it is an astounding achievement. Audemars Piguet, a company who have already proved that they are adept in the art of tricky Minute Repeater mechanisms have taken a new approach to the creation and delivery of sound in order to produce this watch. Using the blueprint of a guitar as inspiration, the gongs of the Minute Repeater behave like the strings, the hammers act like the player's fingers and the gong stud serves as the instrument's bridge. New material placed in the tiny space beneath the movement behaves like the body of the guitar to amplify the sound and, as the gongs are attached to this "soundboard", and are not fixed to the mainplate, a richer tone and improved sound quality is achieved. 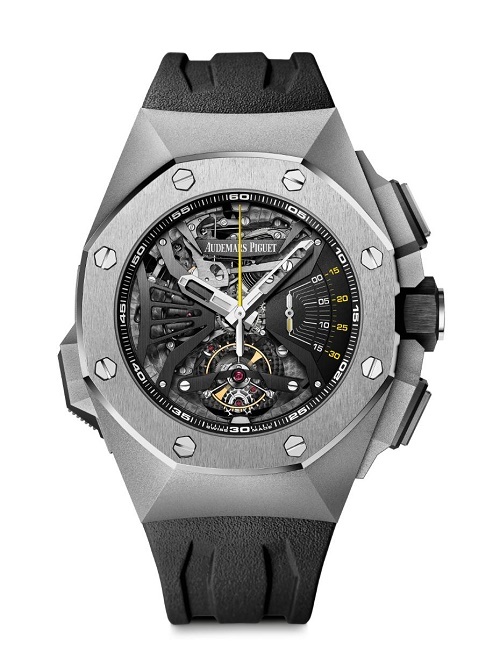 In addition to this innovative new arrangement, Audemars Piguet have also reduced the time between hour and minute chiming sequences and have added a fool-proof mechanism which ensures that clumsy wearers cannot cause ruinous damage by altering the time while the string mechanism is in operation. They didn't have to make it waterproof too. But they did. 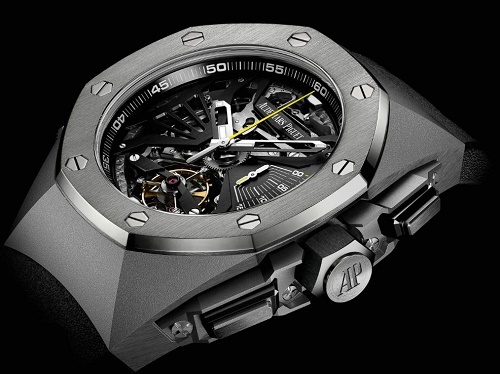 The Audemars Piguet Royal Oak Concept Supersonnerie comes presented in 44mm titanium case with titanium bezel. Inside is the Swiss hand-wound AP in-house Calibre 2937 with a power reserve of 42 hours. Functions are; Minute Repeater on two gongs; Tourbillon; Chronograph with central sweep seconds and 30-minute counter, and hours and minutes. Water resistance is up to 20m. More details from Audemars Piguet here.